Previous image: Map of Western Europe, by Fernão Vaz Dourado (1520-1580). Estimated actual date: ≈1705. The reorganization of the symbolic powers of the Empire, in the Holy Land, 15th-21st c.
History, until the 17th century, has been artificially dilated. This manipulation has several scales. The main manipulation is an invention of a thousand years since the birth of Christ, and the complementary one of one or two centuries, as identified by the NC. The NC attributes this second manipulation to a misinterpretation of ancient texts, but also to a deliberate reconstruction. This exercise, due to the multiple evidences that it identifies, places a precise 185-year invention that affects the history of Western Europe. Especially, it affects the history of Spain, France, Italy and Portugal, but also affects the stories of the Holy Roman Empire, the Vatican, Russia, the Netherlands and England … and the Holy Land, from Constantinople to Egypt. This reconstruction does not affect, at all, the fundamental axis of the NC. On the contrary, it makes sense. 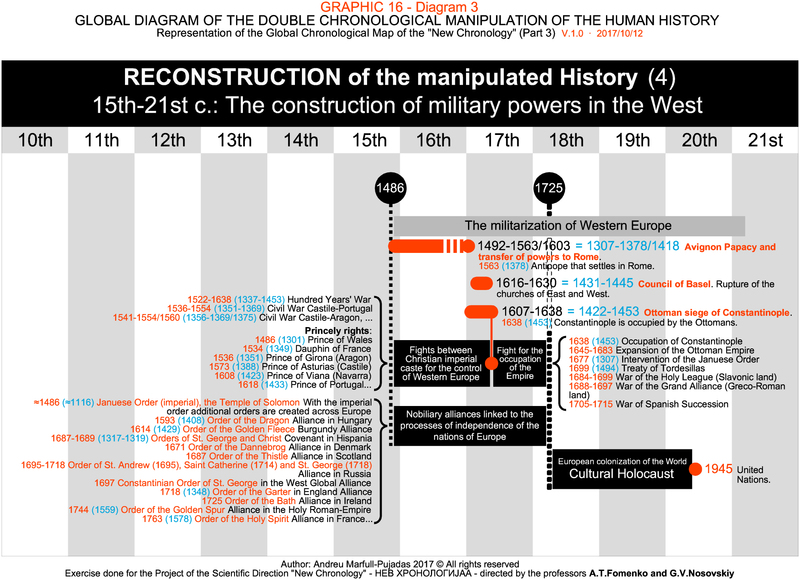 This reconstruction identifies the origin of the Holy Roman Empire, of the Vatican and the powers transferred to Western Europe. But it also identifies the sense of European colonization of the world, the origin of European empires and the background of the Napoleonic Empire. Ultimately, it corroborates the origin of the financial powers of the Jewish caste, and its impact on the economic imperialism that has prevailed since the 19th century. The following is a brief summary of the impact of this exercise on the reconstruction of History, in accordance with the approach of the NC. The intention is to expose the meaning of an integral manipulation of History, between the 17th and 18th centuries, which became an Official History from the 19th century and expanded in the 20th century. 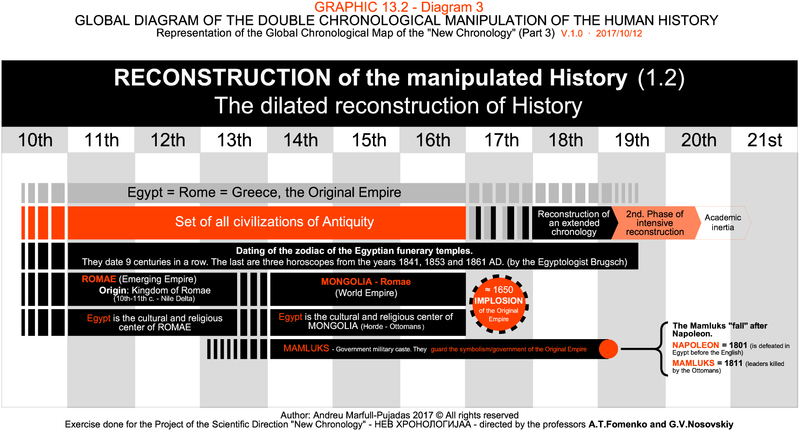 This graphic, as the NC has deciphered, it exposes how an empire that appears on the Nile, in Egypt, around the 10th and 11th centuries AD, is born, expanded, consolidated and fragmented. Its expansion is up to the Volga, from where it starts an expansion (Mongolian) on horseback, to North Africa (crossing Europe), and to America (crossing Asia). From the 16th century, however, the expansion to America is made from Europe, without altering the American civilizations, which continue their expansion. Europe is nourished by gold and silver from America. But the empire suffers a crisis in the 17th century (of legitimacy), and implodes. Then a new division of the world is agreed, new empires are created and the Official History is written. The Real History is written, symbolically, in the Old Testament and in the ancient past. The information that is described in this graph is made from the research work developed by the NC. It exposes how Egypt is the cultural and religious center of the world until the 16th century, and directs the real project of the Roman Empire and the Mongol Empire, from the Nile-Volga axis. The Mamluks would be the main army of this empire, which is defeated at the beginning of the 19th century, along with Napoleon. This information is also made from the research work developed by the NC. It is compatible with the invention of the 185 years identified in this exercise. 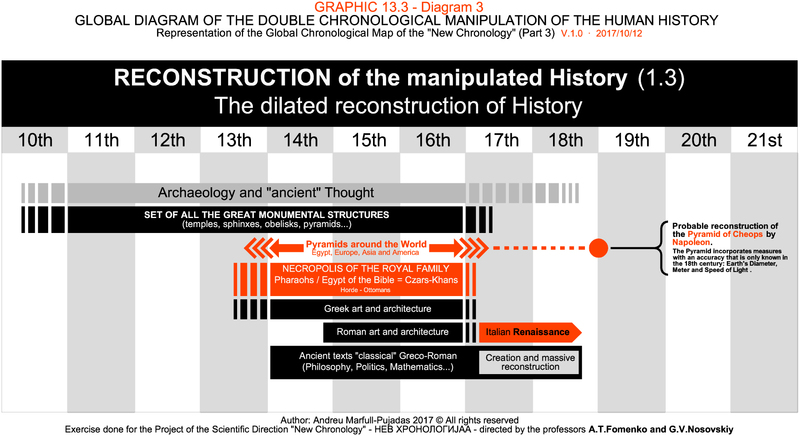 Likewise, it shows a parallelism between the Napoleonic project and the accuracy of the Cheops pyramid. The mystery of its perfection is solved, and it is logical, since in the 19th century there is knowledge that incorporates the pyramid. The mystery of its emptiness is also solved. Most likely, this pyramid was designed for Napoleon himself. Evidently, it was not the first of the great pyramids, but the last. Egypt is, between the 14th and 16th centuries, the cultural and religious center of the world, as well as the necropolis of its leaders. It was also developed Greek and Roman art, and monumentality, associated with technological progress, but Egypt maintained its original essence. In addition, the continuation of styles between classical Greco-Roman art and Renaissance art is identified, which does not appear in the 15th century, appear in the 17th century, coinciding with the transfer of the powers of the Empire to Italy. As described in the Apocalypse (Chapter 11), the Great City, the city where Christ was crucified, is symbolically called Sodom and Egypt. It is Jerusalem, which has several names. The first is Alexandria, where Alexander the Great was killed. They are symbolic deaths, like the death of Jesus in the city of the Jerusalem of Palestine. The city of Jerusalem is a modern city, it is the last “holy city”, and it appears in the 16th century. According to the NC appears probably in the 17th century, but according to this exercise may appear in the 16th century, coinciding with the creation of the myth of the Holy Sepulcher, in honor of the first great emperor, Andronikos Komnenos. AndroniKos, as described by the NC, was born in Crimea, in Fiolent. Crimea = Land of Christ. And is dead in Yoros, next to Constantinople. Yoros = Jerusalem. Constantinople, and Rome, appear in 1380. Constantinople, between the 15th and 16th centuries, is Jerusalem. In the 16th century, Moscow is postulated as the New Jerusalem, which describes the Apocalypse. Now, according to this exercise, it could also appear in the 17th century. The Solomon’s Temple is the temple of the Hagia Sophia (wisdom), of Constantinople, and the Suleiman the Magnificent in the 16th century. This temple is Muslim since the 18th century. Jerusalem is Christian since the 19th century. Before it would have been the symbol of a previous Christianity, which Muslims defend as their own. This is probably one of the most curious manipulations in history. According to the NC, the European colonization of America began in the second half of the 17th century, and before that there was a peaceful link between Europe and America. What is the reason? the reason is because that Europe intends to reoccupy the Empire, and America is isolated, being weaker by the fact of not having developed gunpowder. In this reconstruction proposed by the NC, the US they would not have been an independent English colony, but a new state that occupies the lands of the Russian Horde, when the Horde and Spain would have been on the same side. This exercise maintains the essence of this story, but adds a nuance. The conquests of Hernán Cortés and Yermak Timoféyevich would have been parallel histories, but the expedition of Cortes would have been in the years 1703-1706 (1518-1521), as shown in graphic 18, and would have taken reference to the chronicle of Yermak, who would have been earlier. The occupation of Cortes would not have been a conquest, but a takeover, from Europe, in the name of the Horde and the Holy Empire, which would then have allied. The map that precedes this chapter, by Vaz Dourado, represents this moment. But the powers of the Empire would change in Spain. Appears the Anjou (Bourbon), the Byzantine powers of the Angelus. The Habsburgs, the Byzantine powers, the Laskaris, would cede the throne of Spain. Then the History would be modified. 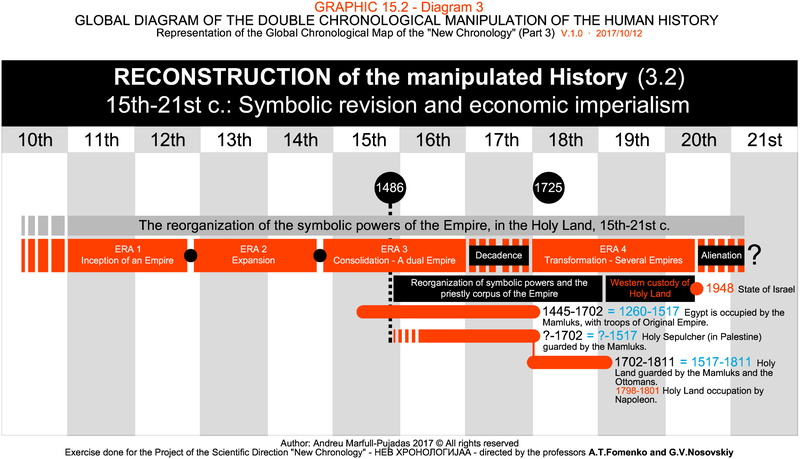 The history of the struggle between the Angelus and the Laskaris, for the control of the army of the Empire (the Order of the Solomon’s Temple) is explained in the detail of graphic 18. In this section, the transfer of the alliance of the Empire (between the Horde and the Ottomans) to the past is explicitly represented. This alliance is moved 185 years into the past, and in its place is created the alternative history of the alliance between the Palaiologos and the Genoese. All of them would be the power of the Empire. Until the 17th century they are not separated definitively. The battles of Kulikovo and Kosovo, between the (official) years of 1380 and 1389, would correspond to the struggles in Constantinople between the years 1195 and 1204. This reconstruction complements the work carried out by the NC. In this exercise, we work, especially, the reconstruction of the history of the origin of the power of the Empire in the Iberian Peninsula. Iberia comes from the Kingdom of Iberia, the Caucasus. The original protagonists are the Catalans (from Provence to Valencia) and the Andalusians. 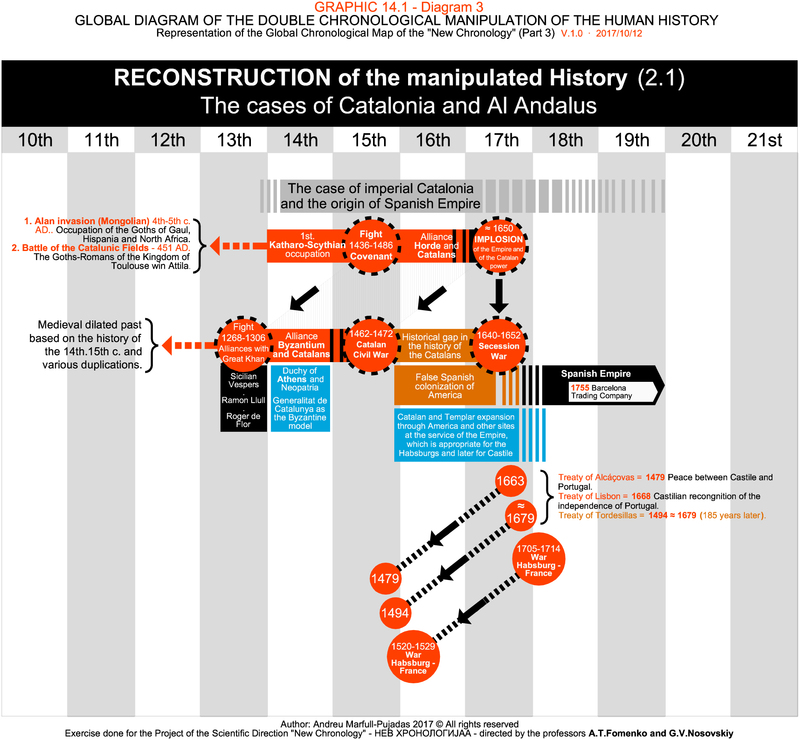 The cases of Catalonia and Al Andalus represent two major episodes manipulated in the history of Spain. Catalonia is the original power of the Horde Empire (Hellenic) in the peninsula, and Al Andalus is the power of the Ottoman Empire, or Arab. The origins of the crowns of Castile and Aragon are an invention, which takes place in the second half of the 17th century and is updated in the 18th and 19th centuries. The origin of the Kingdom of Granada is manipulated between the 17th and 19th centuries. There is also a great manipulation in the history of Vizcaya (Biscay), which represents a second occupation of the Horde in Spain, and the origin of the powers of Navarre, which first occupy France and then Castile (Bourbon=Anjou=Angelus). The linguistic and genetic evidence corroborates this information. The Basque language is a mixture of the Occitan language (Catalan) and the Caucasian language (Slavic and Turkish). Following this approach, the true Basque people appear in the 16th or 17th centuries, not before. This revision of the origin of the Kingdom of Navarre fits in with the reconstruction that is being worked on here. The medieval maps, as a whole, ignore Navarre because then it did not exist. It appears in the latest versions, which should be placed in the 17th century. Complementarily, Galicia, León and Portugal are at the root of Catalonia, and Santiago is its origin. He would be Jacob (Bible), and James I the Conqueror, the first King Komnenos of the official history of Catalonia (associated with Andronikos, and therefore with the Mary Magdalene of Provence). The Holy Chalice in Santiago is an example of his relationship with Mary Magdalene. In fact, everything suggests that this origin is related to the struggle of the 15th century, which culminates with the Ark of the Covenant in 1486. ​​Tirant lo Blanc, Roger de Flor, King Arthur, Constantine, the myth of Paris and Helena de Troy… and Mark Anthony and Cleopatra are part of this story. It is the origin of the Fleur de Lis in Avignon, Montpellier, Naples and England, and the origin of the Cathar and Templar powers in the Papacy of Avignon (which the official history has deliberately disengaged). In the Bible it corresponds to the exodus from Babylon of the Hebrew people (it does not go to Babylon, but comes from Babylon, Cairo), which is installed in Avignon. That is, it is the myth of Moses, which official history has also placed in the 8th century, with the Saracen exodus of the Egyptian general Musa (Moses) that reaches the Rhone (Provence). This story points to 1486, the Apocalypse, the Ark of the Covenant and the symbolic origin of the Biblical people of Israel, settled on the Rhone-Ebro-Granada axis. From there would emerge new symbols, new chronicles, linking the Holy Land with this “Promised Land”. The legends of Saint James and Moses would be part of the same chronicle, as is the origin of Israel (Jacob=James), and the origin of the mystery of the Priory of Sion linked to the Mary Magdalene of Provence. For this reason the Priory of Sion guards the Ark of the Covenant in Aksum (Abyssinia, Ethiopia). Part of his secret is, then, the birth of the people of Israel, the myth of the messiah and his sacred icon. Mary Magdalene represents the inflection of the powers of a divine lineage to an earthly, but Christian, lineage in Western Europe. This story fits perfectly with the reconstruction of the NC. Also, as this exercise suggests, this episode would converge in the transfer of the imperial powers to the West, which would allow designing on the one hand the original project of the Vatican (Hebrew = Mongolian), before its marked Catholic message. In fact, from there it would end up directing the evolution of official history. The chronicle that would end up imposing would adapt to the will of the spiritual school of the West, led in origin from the axis Marseille-Barcelona, ​​with epicenter in Montpeller, that would give rise to the Romanesque, and then to the Gothic. Gothia, in origin, is Crimea, as recognized by the official story. The main transfer would be, then, from Crimea to Avignon. The exodus from Crimea would be the exodus from Egypt, as identified by the NC. From there comes the Cathar people, from Katharia, before being “mutilated” by a later imperial occupation (see graphic 15.3). Everything fits. Originally, the powers of the Empire are based in Occitania. The main axis of the orbit of the Horde (Gothia) is located in Occitania (from northern Italy to Murcia), and the main axis of the Ottomans is located in the Kingdom of Granada (Al Andalus). This episode generates a struggle, which the official history assimilates to the Saracen occupation until Poitiers, in the 8th century. But it also generates a pact: the Ark of the Covenant, which gives rise to a wide range of symbols, and a prosperous stage of Ottoman-Horde coexistence. This coexistence is maintained from 1486 to 1677 (1492 + 185), and thus begins a new era (see section 5.1). The Spanish Empire would have been Castilian between the years 1715 and 1830, when America became independent. It corresponds to the Spanish Golden Age (1530-1645), which is located 185 years into the past. Before, the Empire is directed from the Catalan orbit, allied with Italy and the Holy Empire of the Habsburgs (Laskaris), who are the heirs of the Empire of Nicaea and the natural allies of the Russian Horde (the heirs of the Empire of Trebizond-Crimea). The chronicles of the Catholic Kings and the Habsburgs of Spain are a later invention. This conclusion is entirely compatible with the NC, which deciphers that the Habsburgs are a copy of the Horde, until the beginning of the 17th century. Thus, everything is consistent with the NC: the Spanish colonization does not really begin in 1492, occurs in the second half of the 17th century. The handling of 185 years is confirmed. 1492=1677. The Treaty of Tordesillas is 1679 (1494), and has the purpose of reoccupying the Empire, under the blessing of the last Great Khan, the Pope of Rome (Borja), which occupies Valencia, Naples, Avignon and Rome. For this reason, the independence of Portugal is in 1668, not before, and Tordesillas is later (in 1679). The separation between Castile and Portugal occurs in the 17th century, not before. In a beginning they are Byzantine powers (Horde-Ottomans). The origin of the powers of Portugal is Byzantine, not Burgundian (source: El Becerro). The origin of the powers of Castile is of the Horde, of Vizcaya, that originally would have been allied with the Catalans, and the root is to be found with the Duke of Alba, of Komnenos origin. The Laskaris Komnenos would have settled in Hispania, but in the 18th century they should abandon it, since the Angelus would take their place. Now, the Alba camouflage, and modify its origin (Toledo). Also, certain documents attest that they are, really, Komnenos, despite the attempt to erase them. As indicated in this exercise, the Laskaris Komnenos become the Habsburgs, and the Angelus are transformed into the Anjou (and Bourbon). The first assumption is a new contribution to the NC, the second is a argued conclusion of the NC. 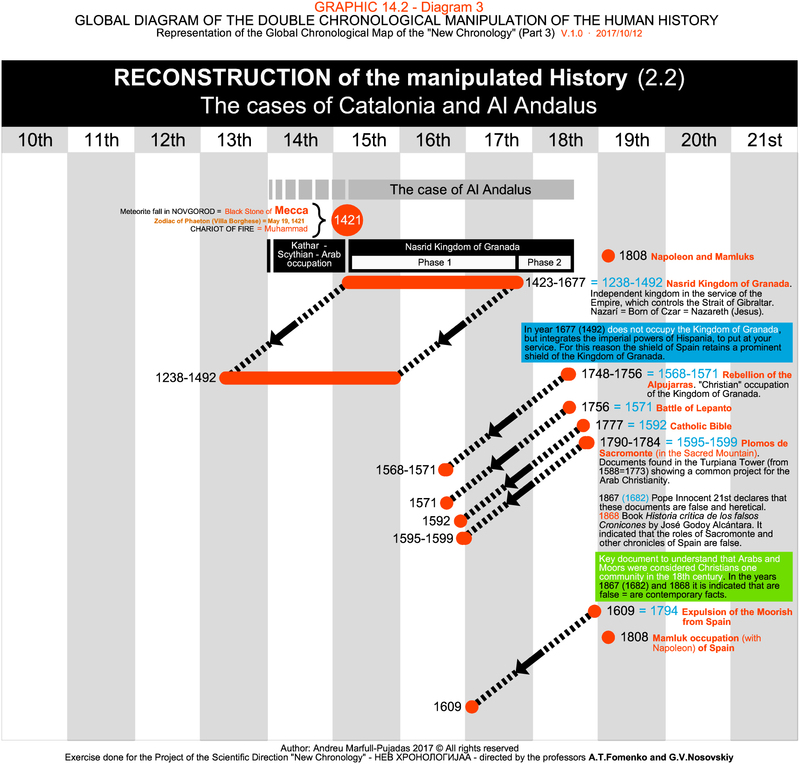 The main history of Catalonia is transferred to the past, in 185 and 370 years. In this way, a false medieval past and a false Modern Age have been created (as the NC deciphers). As indicated, the original powers come from Crimea and Egypt, and promote a pact in 1486 (the Ark of the Covenant), which promotes coexistence and prosperity. But in the 17th century the pact breaks down. The struggle between the Anjou (Angelus) and the Habsburgs (Laskaris) for the control of Occitania (17th century) ends with the partition of Catalonia between France and Spain. The Treaty of Corbeil (1258=1628), together with the Cathar persecution, are facts sent 370 years into the past. 370=185×2. Reason: Graphics 3 and 4. They are facts linked to the official chronicle of the Order of the Solomon’s Temple, which is sent 370 years into the past. But, really, this military Order is intervened by the King of France in 1677 (1307+370), and has to do with the struggle between the French and the Habsburgs that appears then, and with the voyage of Christopher Columbus, in 1492 (1307+185). In this way a triple story is created, where 1307=1492=1677. Reason: graphics 3, 4, 13 and 18. This story must be understood well. In fact, between the pact of 1486 and the 17th century there is a process of settlement that should be interpreted. Throughout the 16th and 17th centuries, despite the Horde-Ottoman coexistence, the powers of the Horde are distributed in Western Europe. These facts are equivalent to the Hundred Years’ War and the Spanish wars of the 14th and 15th centuries, which the official history has placed 185 years into the past. In the same way, the struggle between the Catalans and the king, which originates the union of Castile and Aragon in the 15th century, is also in the 17th century. That is, it has doubled. For this reason the struggle and the outcome is the same. The Catalans are allied with France, and end up united to Castile, in both cases. The official history has doubled the struggle between Catalans and Castilians of the 17th century in two “minor” wars: the Catalan Civil War and the War of the Reapers. In reality, this unique struggle represents the appropriation of Catalonia by the powers that came from Byzantium after the implosion of the Empire in the mid 17th century, which is intervened by the Ottomans. But this duplicity in 185 years is not the only one that affects the conflicts between Catalans and Castilians. The official story has disengaged the struggle for control of Italy (1520-1529) of the struggle for control of Hispania (1705-1714), but are part of the same story. Everything acquires a meaningful sense when both facts overlap, and links the terrible fate of Hernán Cortés and Christopher Columbus (year 1535) with the Treaty of The Hague of 1720. In the detail of graphic 18 this chronicle is extended. It represents the first military occupation of the Empire in Hispania. The official history places it a thousand years into the past. Sicily, Valencia, Mallorca and the Duchies of Athens and Neopatria are Hellenic lands, which the official history makes Catalan. The Generalitat de Catalunya is created in the Byzantine style. The Catalan Empire moves 185 years into the past, and is, in origin, the result of an Ottoman-Horde imperial alliance. It is a result of the Ark of the Covenant, of 1486, which appears next to the “Papacy” of Avignon and multiple myths (Saint James, Mary Magdalene, Jacob, Moses …). James I the Conqueror (associated symbolically to Saint George) is in the axis of this reconstruction, that assimilates it to Jacob and to Saint James. The Occitan Rocafull (official relatives of the Komnenos and the Laskaris, as well as leaders of the Order of Saint John) would be their closest relatives (and, perhaps, the true Rockefellers). 15th-17th c. Catalan and Templar expansion for America and other places at the service of the Empire, which then camouflages with the empire of the Castilian and Portuguese Habsburgs (allies of the Catalans). The wars between Catalans, Castilians and Portuguese, of the 14th and 15th centuries (involving all of Europe, in the context of the Hundred Years War) occur 185 years later. 1522-1638 (1337-1453) Hundred Years’ War. Fight for control of Western Europe, by the imperial powers. It is the germ of the European states. Mid 17th c. Alliance between Castile (intrusive powers of the Russian Horde) and the imperial domains of the Catalans, after a war. Portugal participates, and manages to free itself from Castile, allying itself with England. 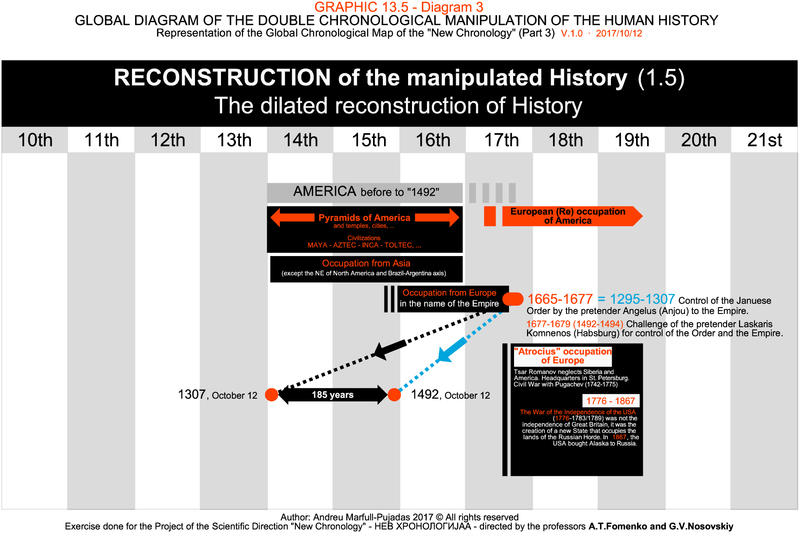 The events of 1677 are translated into two dates: October 12, 1492 and October 12, 1307, separated by 185 years exact. The Chronicle of 1677 has been deleted. It represents the beginning of France’s challenge in the heart of Europe. The official story assimilates it to the Sun King, Louis XIV of Bourbon and Duke of Anjou. The chronicle of 1492 honors a change of powers to regain control of the Empire. Columbus would have been a prince of the Empire, a leader of the Order of the Templars, who puts himself at the service of the Horde. His first trip, begun in Barcelona, ​​would have been the second official trip, in 1678 (1493). The chronicle of 1307 is the end of the independence of the military Order of the Empire in the West. 1705-1714 = 1520-1529 War Hapsburg-France. Fight for the control of Hesperia (axis Italy-Hispania), which is maintained until 1725. The official chronicle of the Catholic Kings, of Charles V, of the union between the crowns of Castile and Aragon, etc., is imposed. It also is created the myth of Christopher Columbus (who was a prince of the Empire), and his Catalan and Templar past is erased. 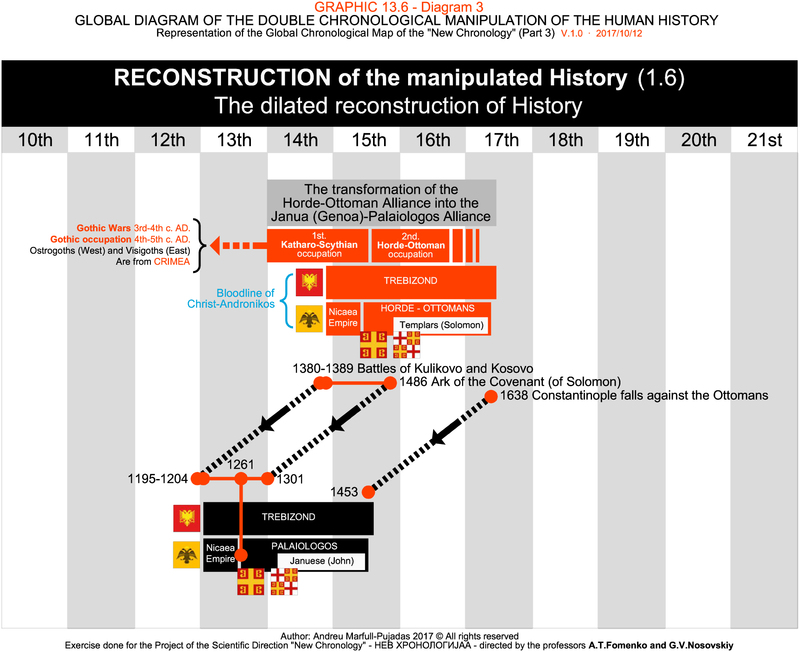 The dispossessions of Columbus and Cortes are not in the year 1535/1536, are in 1720/1721, coinciding with the withdrawal of the Habsburgs from Spain (Treaty of The Hague of 1720). This reconstruction is a preliminary version. But it adapts to the alternative historical narrative proposed by the NC, and also to the leap of 185 years. As it is exposed, Al Andalus would have been the Nasrid Kingdom of Granada, which officially stands in the years 1238-1492. You just have to add 185 years to understand it well. It corresponds to the years 1423-1677. It coincides perfectly with the era of splendor of the Empire. And it corresponds to the fall of the great meteorite that the NC places in the year 1421. This would be the origin of Mecca, the chariot of fire of Muhammad, and also of the Kingdom of Granada. It is, therefore, a kingdom with a great symbolic content. Initially it represents the control of the Strait of Gibraltar by the Holy Land. But from the year 1677 (1492) is incorporated into the new powers of Hispania, which intend to re-occupy the world in the name of the Holy Roman Empire. Granada was not defeated nor were the Arabs expelled in 1492 (1677). It was a kingdom integrated into the new European Roman project. For this reason Granada is a kingdom that is part of the Shield of Spain. According to the provisional reconstruction shown in this graph, the real expulsion of the Arabs from Andalusia takes place in 1794 (1609), after the French Revolution (1789) and before the Napoleonic occupation of Spain, the Holy Land, Rome, Malta , Genoa, etc., by the Mamluks (in 1808). This reconstruction corroborates the symbolic division between Christianity and Islam that deciphers the NC. The NC states that the rupture between the Koran and the Bible takes place between the 18th and 19th centuries. This would also be the rupture between Arabs and Christians in Hispania. Independent kingdom at the service of the Empire, which controls the Strait of Gibraltar. Nasrid (“Nazarí” = Born of the Czar = Nazareth (Jesus). The year 1677 (1492) the Kingdom of Granada is not occupied, is integrated into the imperial powers of Hispania, to be at their service. For this reason, the coat of arms of Spain keeps the coat of arms of the Kingdom of Granada in a prominent place. 1748-1756 = 1568-1571 Rebellion of the Alpujarras. “Christian” occupation of the Kingdom of Granada. Documents found in the Turpiana Tower (1588=1773) that show a common project for Christianity and the Arabs. Essential document to understand that Arabs and Moors were considered a Christian people in the 18th century. In the years 1682 (1867) and 1868 they are said to be false = they are contemporary facts. 1867 (1682) Pope Innocent XI declares that these documents are false and heretical. 1868 Book Historia crítica de los falsos cronicones (“Critical history of false chronicles”), by José Godoy Alcántara. It is said that the Lead Books of Sacromonte and other chronicles are false. If History is modified, new symbols are created, associated with new values. This is the case of the origin of economic imperialism that imposed in the 19th century. Until then, the design of finances is an instrument at the service of the Original Empire. The Jewish caste is the main guarantor, and at the root of the priestly power that creates it. Since the 19th century it has become a power allied with the powers of independent states, and of large corporations (this second part, however, is not explored in this exercise, only the understanding of its origin is deepened). The origin of the imperial powers, as explored here, is located in the Ark of the Covenant, the year 1486. The end of these powers, transformed into a new alliance, is located in the 18th century, coinciding with the design of the bloody European colonization of the world. Due to this second alliance the symbols of power are altered, and Economic Imperialism appears. Origin of the duality of the Christian emperor (King of Kings) in Constantinople and Ethiopia / of the Januese Knights (Templars) / of the Priory of Sion and the symbols of Mary Magdalene and the Holy Spirit. Division of powers: Symbolic eternal Christ = CHRIST / Temporal power = EMPEROR / Earthly authority = PRESTER JOHN. An empire protected by the Prester John is conceived, with an Emperor and a Sultan, and fragmented vassal powers. The project promotes a Sacred History and spiritual symbols, but in the 17th c. fails leading to multiple religious schools (Roma, Medina, Tibet, Beijing, Kyoto…). Arab-Persian powers (OTTOMANS) occupy the center of the Empire (Egypt and the Black Sea). Hellenic authorities (HORDE) seek refuge in Europe. ANGELUS (Epirus) = occupied France. LASKARIS KONMENUS (Athens) = occupy the center of Europe, northern Italy and the Iberian Peninsula… involved Russia. Palaiologos (Morea) = occupy Russia and Italy. A managed by the Pope of Rome, various emperors and large independent nation-states it is conceived Empire. The project changes History, imposed in 18th and 19th centuries. Division of powers: Symbolic eternal Christ = CHRIST / Temporary power = MULTIPLE EMPIRES / Earthly Authority = POPE OF ROME. 1540 (1725) = IHS – Society of Jesus. 1725 = Treaty of Vienna. End of the struggle between the Angelus (Anjou) and Laskaris (Habsburg). The Society drives a new world order where the main empires are legitimazed and rewrites our History in a global project. 1540-1725 False antiquity of the Society of Jesus. 1725 (1540) The Company was founded in Rome (origin in 1707 (1522) in Montserrat (Barcelona), and in 1719 (1534) in Paris). The year 1707 represents the inflection of the authority of the Habsburgs (Laskaris) in Hispania. The year 1719 represents the authority of Paris (Anjou=Angelus) on the Spanish Jesuit project. 1773 The Society is dissolved in the Bourbon orbit. 1776 Independence of the USA. 1814 The Society is restored. 1814 Napoleon falls and Italy breaks. 1814 End of the Republic of Genoa and independence of the Swiss Confederation (regarding the Holy Roman Empire). Probable origin of the Papal States and of the famous Pontifical Swiss Guard. 1870 Italy is reunified – Savoy (Laskaris family). 1870 The Papal States fall. 1958 IESE (Pamplona) – Opus Dei. 1958 ESADE (Barcelona) – Society of Jesus. 1798-1801 Holy Land occupation by Napoleon. In 1677 (1307) is intervened by the King of France. 1660 (1290) England and Wales. 1677 (1492) Castile and Aragon. 1702 (1517) The 95 Theses of M. Luther. 1719 (1534) Act of Supremacy of the King of England, as head of the Church in England. 1717-1736 FREEMASONRY – Secret rebuilding of the Order of the Temple of Solomon. On April 23, 303, St. George died. On April 23, 1616, Cervantes and Shakespeare die. 1616-303-1000=313 year of the Edict of Milan, in which religious freedom is declared. Miguel de Cervantes and William Shakespeare were authors hidden by Freemasonry, who recorded the manipulation of recent history in Europe (Shakespeare) and religious and imperialist farce in Spain, with the delirium of a decadent gentleman (Cervantes). 1814 End of the Republic of Genoa. 1814 Independence of the Swiss Confederation. The militarization of Europe is part of the nobiliary alliances that gradually transfer power to the monarchs. In origin, the monarchs lead the military, nobiliary authority, which grants the Empire. When the Empire breaks, monarchs become independent and, over time, nation-states are created. The power of the Habsburgs is, in origin, the power of the Order of the Golden Fleece. The lamb of the golden fleece is the lamb slaughtered of the Apocalypse. The chains of the necklace are the “B” of the Empire, visible to the shield of Constantinople. They are the project of reconstruction of the powers in Europe, of the Holy Roman Empire (of the Germanic nation). The coat of arms of the Habsburgs is the shield of Nicaea, of the LasKaris. They are the same power. But the lineage spreads Europe and the Empire fractures, and new nations emerge in the 16th, 17th, and 18th centuries. With the imperial order additional orders are created across Europe. 1593 (1408) Order of the Dragon Alliance in Hungary. 1614 (1429) Order of the Golden Fleece Burgundy Alliance. 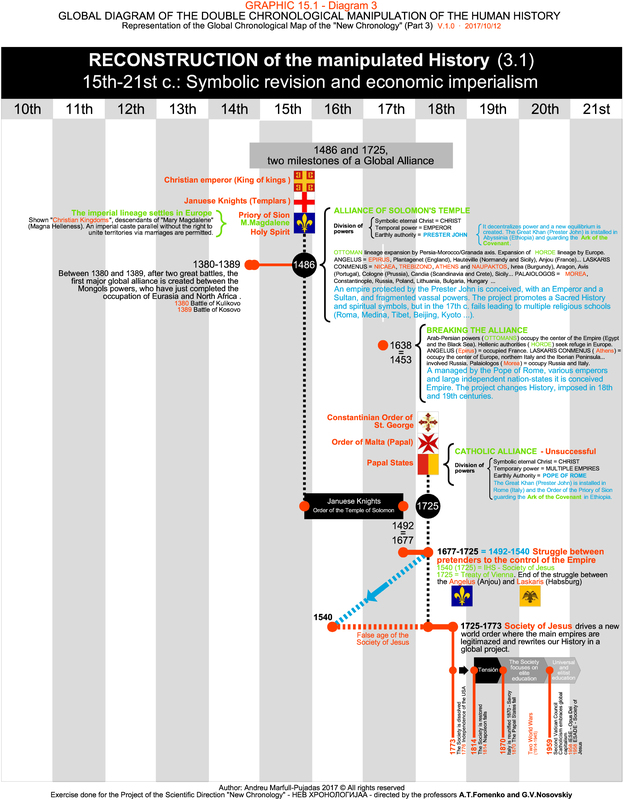 1687-1689 (1317-1319) Orders of St. George and Christ Covenant in Hispania. 1671 Order of the Dannebrog Alliance in Denmark. 1687 Order of the Thistle Alliance in Scotland. 1695-1718 Order of St. Andrew (1695), Saint Catherine (1714) and St. George (1718) Alliance in Russia. 1697 Constantinian Order of St. George in the West Global Alliance. 1718 or 1533 (1348) Order of the Garter in England Alliance. 1725 Order of the Bath Alliance in Ireland. 1744 (1559) Order of the Golden Spur Alliance in the Holy Roman-Empire. 1522-1638 (1337-1453) Hundred Years’ War. 1536-1554 (1351-1369) Civil War Castile-Portugal. 1486 (1301) Prince of Wales. 1534 (1349) Dauphin of France. 1536 (1351) Prince of Girona (Aragon). 1573 (1388) Prince of Asturias (Castile). 1608 (1423) Prince of Viana (Navarra). 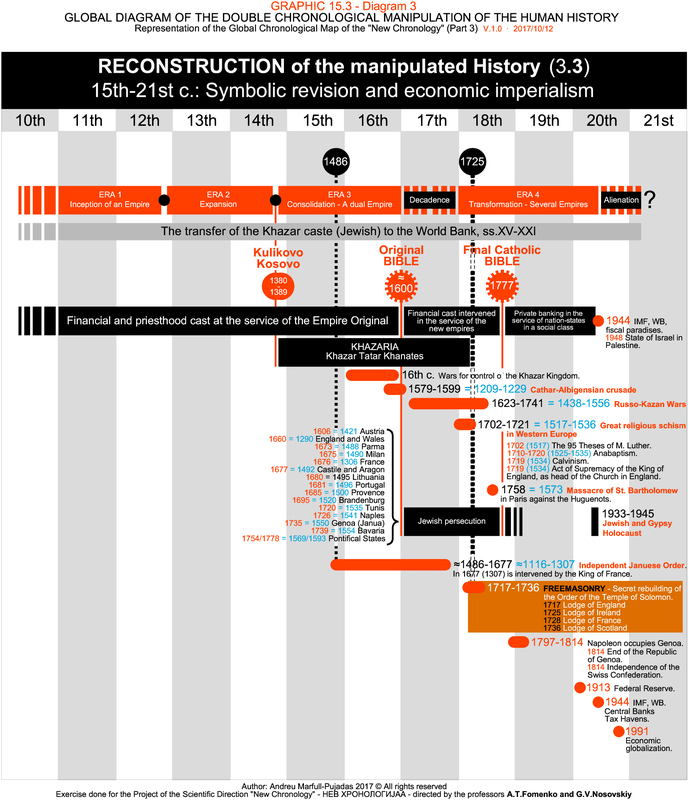 ≈1492-1563/1603 = 1307-1378/1418 Avignon Papacy and transfer of powers to Rome. 1563 (1378) Antipope that settles in Rome. 1638 (1453) Constantinople is occupied by the Ottomans. 1638 (1453) Occupation of Constantinople. 1645-1683 Expansion of the Ottoman Empire. 1677 (1307) Intervention of the Januese Order. 1699 (1494) Treaty of Tordesillas. 1684-1699 War of the Holy League (Slavonic land). 1688-1697 War of the Grand Alliance (Greco-Roman land). 1705-1715 War of Spanish Succession.